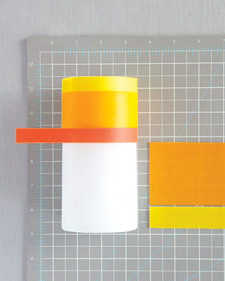 Learn how to make these striped candles for a bold and colorful wedding centerpiece. 1. With a craft knife, cut sheets of tinted wax into strips to fit the heights and circumferences of your various size candles. Decorating wax in orange, gold yellow, and lemon yellow by Stockmar, from A Toy Garden. 2. Soften the wax strips with a hair dryer for a minute or so to make them more pliable. Wrap them around candles, cut off any excess wax at the overlap, and seal so the look is seamless.